SEOUL - US President Donald Trump has urged North Korea to “come to the table and make a deal” over a spiralling nuclear weapons and missile crisis, even as he stressed that the US is prepared to assert its military might “if needed” to defend itself and its allies. Speaking at a joint press conference on Tuesday (Nov 7) after a summit with South Korean President Moon Jae In, Mr Trump also called on the world to unite in confronting the nuclear threat and “prevent the North Korean dictator (Mr Kim Jong Un) from threatening millions of innocent lives”. “We are showing great strength and I think they understand we have unparalleled strength. With that said, I really believe it makes sense for North Korea to come to the table and make a deal that is good for the people of North Korea and people of the world,” he said. While declining to comment on the possibility of holding direct talks, Mr Trump said the US will focus on resolving the problem “using all available tools short of military action”. Washington’s approach so far has yielded some progress, he added, with China being “very, very helpful” in trying to address the nuclear problem. The US President arrived in Seoul from Tokyo before noon on Tuesday as part of his 12-day Asia tour, on which the agenda is largely dominated by the North Korea nuclear crisis. The regime had raised tensions by lobbing missiles over Japan, conducting its sixth nuclear test, and hurling threats and insults at the US. Mr Trump’s first stop was the new US base Camp Humphreys in Pyeongtaek, a port city 60km south of Seoul, where Mr Moon gave him a surprise welcome. They met again at the presidential Blue House, where Mr Trump received an official welcome and inspected an honour guard as part of his state visit. He is slated to give a speech at the National Assembly on Wednesday. During their summit, the two leaders agreed to work towards boosting South Korea’s defence against Pyongyang’s continued provocations. This includes removing the payload limit on South Korean ballistic missiles, deploying more US strategic assets to the region on a rotational basis, and buying advanced military hardware from the US, including surveillance equipment. The additional defence spending would help to narrow the US trade deficit with South Korea, said Mr Trump, emphasising that ongoing re-negotiations of a US-Korea free trade deal will make it more fair and in America’s favour. He also thanked Mr Moon for helping to reduce the US-Korea trade deficit of US$27.6 billion (S$37.65 billion) last year - more than double the figure in 2012, when the agreement first went into effect. Mr Trump was also full of praise for Camp Humphreys - the biggest and fanciest US base overseas - and did not further press South Korea to bear a bigger share of the cost of maintaining 28,000 US troops here. He also sought to assuage public concern that South Korea was second fiddle to America’s other ally, Japan. 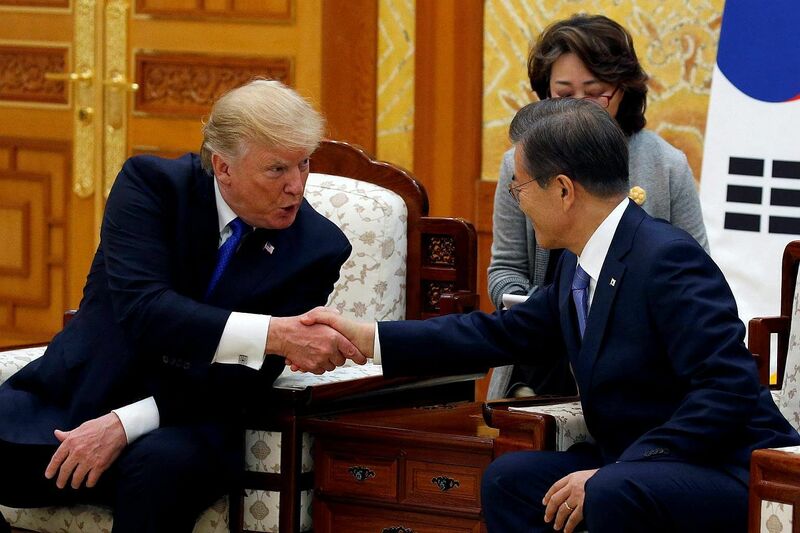 The term “Korea passing” was even coined by the South Korean media to describe fears of Seoul being left out of important Washington decisions as the friendship between Mr Trump and Japanese Prime Minister deepened over golf while Mr Moon, who assumed office only in May, was sidelined. It was also unsettling for South Koreans to know that Mr Trump’s visit to Seoul lasted only 24 hours - half the time he spent in Tokyo. 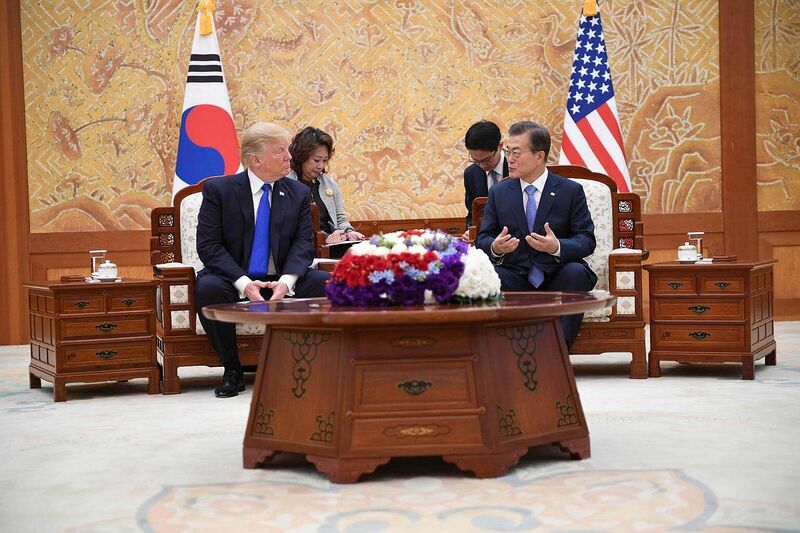 Analysts said the summit ended on a cordial note with no sore points, as the South Korean government worked hard to alleviate Mr Trump’s main concerns over the US trade deficit and defence cost sharing. The Camp Humphreys visit, for instance, was meant to demonstrate the fact that South Korea paid 92 per cent of the construction bill of US$10.7 billion.